THE STORY - The misfits of Mötley Crüe rise from the streets of Hollywood to the heights of international fame in the 1980s. THE GOOD - Undeniably honest in its depiction of the band’s reckless behavior. Well acted and directed. ​​​​I prepared to watch “The Dirt” as the epitome of a casual Mötley Crüe fan. Which is to say, I have heard “Shout at the Devil” before and found it really catchy. That was the extent of my Mötley Crüe knowledge. So to the best of my knowledge, this was yet another band-supervised biopic in the vein of last year’s “Bohemian Rhapsody.” I expected a bland, whitewashed rise and fall and redemption music biopic, the likes of which we have seen so many of since the early 2000s. To give you a play by play of how my watching experience went: “I first notice that the film is directed by Jeff Tremaine who is best known for helming the “Jackass” movies. I thought that was weird, but hey, people always like to branch out and maybe he wants to do something a little more serious until the first scene came on featuring a woman squirting across the room and onto the camera!! “The Dirt” is based on an absolutely nasty tell-all penned by the band members themselves who apparently do not care at all about the fact that they have painted themselves as absolute deviants. They had final editorial say in the same way Queen did on their film and they do not care. So…”The Dirt” is not a celebration of the music of Mötley Crüe. Hell, the music is honestly an afterthought in the movie. “The Dirt” is “The Wolf of Wall Street” of music movies. Two hours straight of the bananas shenanigans that the band members got up to as the bad boys of 80’s rock. We’re talking snorting fire ants in lieu of cocaine…but then also snorting lots of cocaine too. Lots and lots of heroin. Drunk driving. Mooning people. Flashing people. Dropping refrigerators on people’s cars. Killing people. Drinking Ozzy Osborne’s urine. Punching Pete Davidson in the nuts. Punching other people in the face. This is not a story of men who rose to greatness and produced timeless music. This is a story of people who went absolutely insane with fame and power and somehow emerged alive on the other side. Your mileage with the film will vary based on how much you’re willing to tolerate the behavior on screen. The story, which is narrated by fourth wall breaking band members and acquaintances, occasionally passes judgment on the actions on display, but like “The Wolf of Wall Street,” it generally allows the audience to provide their own interpretation. The film doesn’t explicitly say “it is bad that these guys did these things.” It’s easy to see why one of the minds behind “Jackass” was drawn to this film. Sometimes, the film is hysterical and sometimes it absolutely makes you cringe. The characters are utterly misogynistic in their behavior. You really want to hate them. And the film’s triumphant final shot seems to indicate “hey, but we made it right? We formed great friendships and everyone remembers us,” which suggests that those involved in the filmmaking don’t entirely want to condemn them for what they’ve done. On the other hand, we condemned Queen for sanitizing their own story. 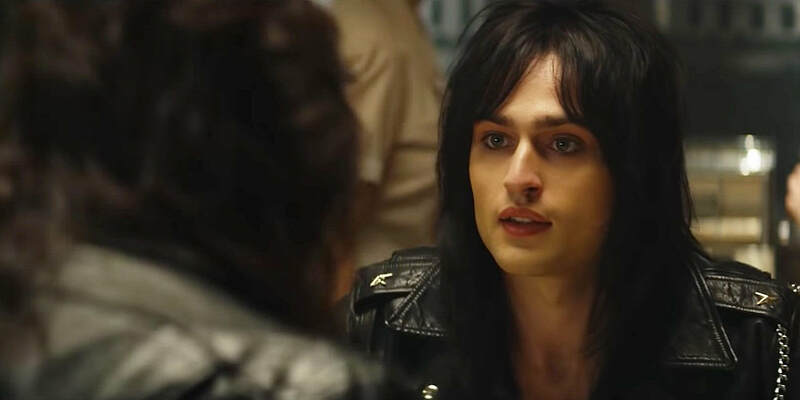 Nikki Sixx (Douglas Booth) acknowledges in the narration that his own addiction and behavior were harming those around him. So there is at least a degree of repentance, but the regret seems largely confined to “yeah man, I shouldn’t have gotten addicted to heroin” as opposed to overall repentance for broader behavior. It is undeniably refreshing to see people willing to admit the degree to which they messed up, instead of trying to bury it. This film will likely leave me conflicted for some time in that regard. It’s the anti-“Bohemian Rhapsody” but it goes so far in the opposite direction that it proves to be morally conflicting. As for the film’s other aspects, Jeff Tremaine proves adept at cutting together Adam McKay-esque rapid fire fourth wall breaking history. The writing is not as witty or clever as “The Big Short” and is sometimes even more on-the-nose than “Vice.” And it has more uses of “f*ck” than “Deadpool.” At the same time, the style is so refreshing compared to the tired tropes often used in musician biopics. In short, within the music biopic genre, “The Dirt” is unique. It is unflinchingly candid and brings an amazing sense of energy. But it honestly doesn’t necessarily entail contrition. It’s difficult to determine how much the filmmakers are disgusted by the band’s actions and how much they tacitly admire them. On one hand, more power to the film for making me think about this. On the other hand, is something that is even ambiguous in how it treats such flagrant misogyny and bad behavior really what society needs right now? Then again, Mötley Crüe lived for controversy. So perhaps this is the perfect biopic for them.